The CSIL Market Research Windows and Doors: world market outlook, contains current and historical data (production, consumption, imports, exports) and analysis of Window and Door industry for a total of 70 countries. It focuses on the 30 most important Windows and Doors markets: Argentina, Australia, Austria, Belgium, Brazil, Canada, China, Czech Republic, Denmark, Finland, France, Germany, Italy, Japan, Mexico, Netherlands, Norway, Poland, Portugal, Romania, Russia, Singapore, South Korea, Spain, Sweden, Switzerland, Taiwan, Turkey, United Kingdom and the United States. Data on international trade of windows and doors cover (in addition to the 30 countries listed above), 40 other countries, for a total of 70 countries. Part I deals with production, consumption and international trade of Windows and Doors and includes a section on world Windows and Doors statistics and an appendix with methodology notes. Windows and Doors industry trends of production, apparent consumption, exports, imports for the years 2003-2012 and forecasts of yearly changes in Windows and Doors consumption in 2013 and 2014. Major trading partners (countries of origin of imports and destination of exports of Windows and Doors). 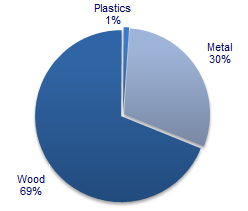 Information on breakdown of production by material (wood, metal, plastics) for a selection of countries. Part III includes Short profiles of major Windows and Doors manufacturers associations worldwide and a list of major sector fairs. Part IV contains addresses of top Windows and Doors manufacturers worldwide. In terms of breakdown of windows and doors production by material, there are differences in the various countries of the world. For example as regard as the European countries, in southern Europe there is a preference for metal windows while in Nordic countries wooden windows are more requested.